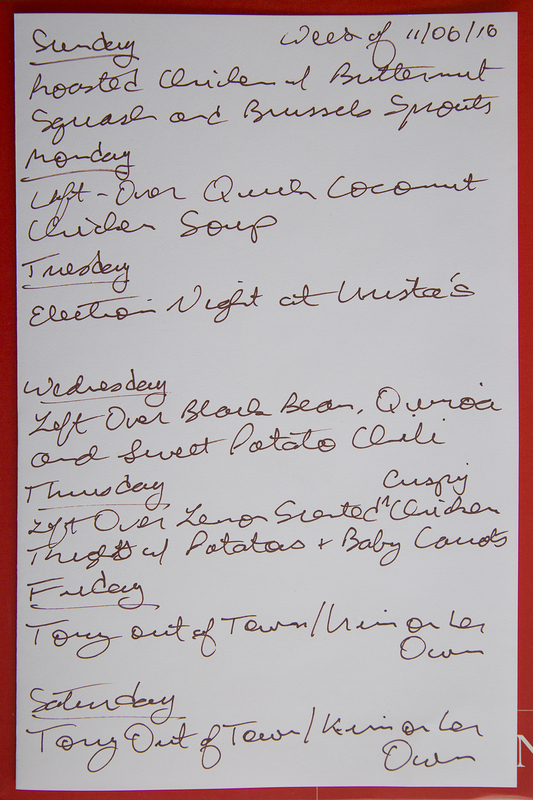 We have a pretty low-key menu planned for this week, as we will focus mostly on eating leftovers from last week. We’ll roast a couple of chicken breasts on Sunday night, which we’ll have with the brussels sprouts left over from the Mustard Brined Pork Loin with Sautéed Brussels Sprouts from our Oktoberfest dinner. We still have a few bottles of beer left over from Oktoberfest, so we’ll have beer with dinner. On Monday night, we’ll have the left over Quick Coconut Chicken Soup. The soup was very good, but the recipe could have used a little more seasoning, so we will kick it up a little bit. If we can find the time, we may also add some cooked rice, just to give the soup a little more body. We’ll enjoy an Election Night pizza dinner at our friend Krista’s on Tuesday as we watch the voting returns come in. Kim has her French class on Wednesday night, but will probably be home early enough to enjoy some left over Black Bean, Sweet Potato, and Quinoa Chili for dinner. Tony had some of the chili for dinner last week with cheddar made from goat’s milk and some (store-bought) corn bread, both of which were great accompaniments; we’ll do the same again this week. Tony will be out of town at a conference on Friday and Saturday, so our last dinner together this week will be on Thursday night. We’ll have leftover Lemon Scented Crispy Chicken Thighs with Potatoes and Baby Carrots. We had this on Friday night and it was spectacular: the chicken was super crispy and cooked perfectly and the toasted bread cubes that also go into the dish soaked up all the chickeny goodness without getting soggy. We paired the dish with a sparkling wine, which was perfect for cleansing the palate after each rich, delicious bite, so we’ll probably do the same on Thursday.